Completely inadvertently, I ended up watching two episodes of I’ll Have What Phil’s Having last night. 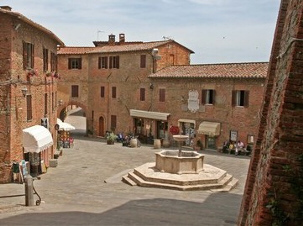 I had never even heard of the show before, but it instantly hooked me when I saw the shot of the piazza in Panicale, a small hilltown (half the population of Weston!) in Umbria. It reminded me right away of Siena and Assisi and other favorite locales in my favorite country, Italy. There are actually three reasons to watch this show: travel, gastronomy, and the host. The two episodes that I saw yesterday — the aforementioned Panicale and one in Paris — captured the heart of each place in a way that your typical travel show can’t. Both were immersive, not comprehensive. Second, although the focus of each episode is of course gastronomic (as the title suggests), there’s no sense of teaching recipes to the viewer. It’s just that the show really does make the viewer want to say “I‘ll have what Phil’s having.” And that brings us to the third reason, the host. I felt immediately at home with Phil Rosenthal (maybe you have to be Jewish and/or from the New York City area in order to appreciate him fully); he obviously enjoys his show, his food, and the people he talks with in other countries. He manages to be both funny and serious at the same time. I am so looking forward to watching the remaining episodes; these two have me thoroughly convinced.